Taipei, Jan. 18 (CNA) A new tax reform bill passed on Thursday raises the personal standard deduction of comprehensive tax and the corporate income tax rate for companies, decreasing contributions from individuals but requiring businesses to make up the shortfall, said Lai Cheng-i (賴正鎰), head of the General Chamber of Commerce of the Republic of China, who suggested the move is intended win votes at the ballot box. Lai made his remarks following the passing by the Legislative Yuan on Thursday of a tax reform bill that increases the corporate income tax rate from 17 percent to 20 percent. In addition, the rate for small and medium-sized enterprises (SMEs) with taxable income less of than NT$500,000 will be raised to 18 percent, 19 percent and 20 percent over the next three years. Lin Hui-ying (林慧瑛), president of Taiwan's National Association of Small and Medium Enterprises, said small- and medium-sized enterprises (SMEs) account for a majority of businesses, so perhaps the government has decided to tax them at 20 percent because it is concerned about the shortfall in tax revenue. Originally it was hoped that the government would take care of small businesses, but in the end it approved a 20% tax rate, Lin said, adding that she was "not very satisfied, but we can only accept it" and the fact it will be phased in makes it easier for them to adjust. Retained earnings are the lifeline of SMEs, but the government still wants to tax them at five percent, she said, explaining that such a decision left her feeling "a little helpless." SMEs are not like listed or over-the-counter companies, as large firms have many resources, Lin said, adding that she hopes the government will use Japan and South Korea as examples so that SMEs are categorized into different brackets and receive various preferential treatment. Lai from the General Chamber of Commerce said cutting the top rate of personal income tax to 40 percent "can be easily seen as currying favor with voters," adding that Taiwan's voting culture has already caused abnormal situations such as the five-day work week plan and tax code revision. Increasing business income tax to 20 percent is "a very heavy burden" as the gross margin of many industries is less than 3 percent, he said. Tsai Lian-sheng (蔡練生), Taiwan-based Chinese National Federation of Industries secretary-general, said tax reduction is an international trend with countries as different as the United States and China going down that route. In other words, the increase in both the business income and dividend income tax will impact business investment in Taiwan and exacerbate the burden on enterprises, said Tsai. The government wants enterprises to raise salaries and to increase the basic wage, but is also ramping up taxes on companies, said Tsai, adding that enterprises in Taiwan are going to find it increasingly difficult to operate. Even though the tax code revision reduces the tax burden on individuals, it makes life more difficult for businesses, said Tsai, who pointed out that a five percent tax on retained earnings represents a double tax on business and called on the government to abolish it. The ruling Democratic Progressive Party's spokesman Cheng Yun-peng (鄭運鵬) said the revised tax code will ease the tax burden on wage earners, low- and middle-income groups, small- and medium-sized businesses as well as innovative firms and help create a business environment that encourages investment. 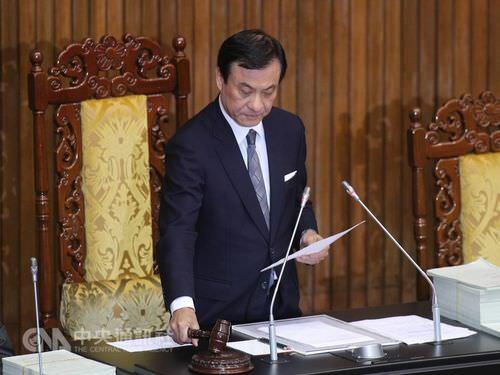 Premier Lai Ching-te (賴清德) said, when people file their tax returns next year, they will see Taiwan has adopted a tax system that is fairer than before, one that benefits even more wage earners and will revitalize the country's capital market. With the new tax code taking effect, "Taiwan will make a big step in its effort to boost the economy," Lai said. Legislative Speaker Su Chia-chyuan (蘇嘉全) said the new tax code will do more to realize a fair and just society as lower-income people will pay less or no tax while profit-making corporations will have a chance to "repay society."